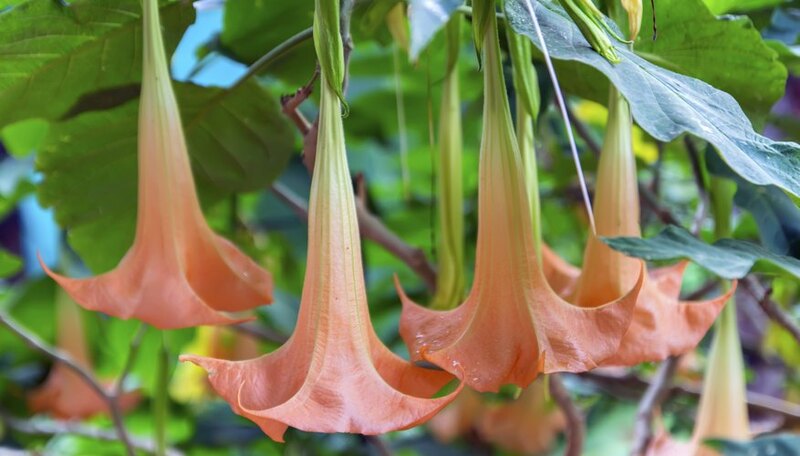 Commonly called angel’s trumpets, plants of the genus Brugmansia have long been cultivated for their showy, trumpet-shaped flowers and graceful growth habit. They thrive within U.S. Department of Agriculture plant hardiness zones 10B to 11, where they will bloom vigorously under most conditions. Angel’s trumpets perform best with a little hands-on attention throughout the year, although care must be taken when working closely with them because all parts of the plant are highly toxic. Angel's trumpets are moderate to heavy feeders, especially when grown under high-light conditions. Both container and garden-grown specimens respond well to balanced, 15-15-15 analysis fertilizer, as well as bloom-boosting 7-9-5 fertilizer. Feed weekly from spring until autumn with 1/2 teaspoon of fertilizer dissolved in 1 gallon of water. If yellow leaves occur, increase feeding to twice weekly until the foliage turns green again. Garden-grown angel's trumpets also do well with a light annual compost dressing to provide a steady source of nutrients. Spread a 1-inch layer of compost around the plant, keeping it away from the main stem. Although moderately drought tolerant, angel's trumpets will have a healthier, more lush appearance if routinely watered. Provide 1 inch of water each week, saturating the top 6 to 15 inches of soil. Increase watering to twice weekly if the plant wilts during hot, dry weather. Potted angel's trumpets require water whenever their soil dries out on the surface. Add water until the soil is saturated and the excess drains from the pot. Angel's trumpets respond poorly to most chlorinated tap water. "Season" their water before use by filling a bucket and letting it stand for 24 hours to allow the chemicals to outgas. Pruning is key to keeping angel's trumpets looking healthy and tidy. Prune after flowering, removing spent flowers and any damaged, discolored or otherwise undesirable growth. Every two to three years, hard prune the entire plant to encourage a bushier growth habit. Remove side branches if a tree-like shape is desirable, or leave the side branches in place if a shrub-like look is preferred. Before pruning angel's trumpets, soak pruning shears for five minutes in undiluted household disinfectant, then rinse them well to remove any pathogens. Angel's trumpets are toxic to humans and pets, so wear gloves when pruning and discard the pruned matter to avoid accidental contact. Angel's trumpets seldom suffer from serious diseases if grown under suitably bright, warm conditions. They may attract significant colonies of whiteflies and spider mites, however, as well as aphids and mealybugs. Treat infestations immediately if symptoms such as discolored foliage, cottony residue or honeydew appear on the plant. Create a 2-percent insecticidal soap solution by mixing 5 tablespoons of insecticidal soap in 1 gallon of water. Apply it liberally to the affected area with a spray bottle, and rinse off the soap two to three hours later to prevent foliage damage. Most infestations will resolve in two weeks with applications every four to seven days. Outside their preferred USDA hardiness zone range, angel's trumpets are often grown in pots and overwintered indoors. They perform best in a cool, moderately bright location sheltered from heater vents and other heat sources. Water once a month, providing just enough to keep the stems from shriveling. Angel's trumpets lose their foliage when dormant; don't worry, it is a natural part of their yearly cycle. In spring, move it back outdoors to a sunny location and resume normal watering. New growth will emerge as the season progresses. North Carolina State University Cooperative Extension Service: Brugmansia Spp.